A strike by tens of thousands of teachers in Los Angeles, the nation's second-largest school district, began Monday with picketing and a protest march to district headquarters after the two sides did not renew negotiations over the weekend. Talks broke down Friday when the teachers' union rejected as "woefully inadequate" a new offer from the LA Unified School District. With no new discussions scheduled, pickets began Monday morning as teachers stood firm on sticking points including higher pay and smaller class sizes. "We are here for the kids, to try to get the district to understand that our classes are too large," one teacher said as he held an umbrella to ward off rain. "We need more help in the classrooms, we need more help in the offices. We need nurses paid for at every school, and we had no choice. We don't want to be out here; I'd rather be in my classroom. But that's where it's gotten, and we'll be out here as long as we need to be." Schools will stay open despite the walkout. The district has hired hundreds of substitutes to replace teachers and others who leave for picket lines. The union has said it was "irresponsible" to hire subs and called on parents to consider keeping students home or join marchers during the strike. At a Monday morning news conference, United Teachers Los Angeles President Alex Caputo-Pearl addressed fellow union members, parents and students at John Marshall High School. It was one of the locations where picketing began. "Here we are on a rainy day in the richest country in the world, in the richest state in the country, in a state that's blue as it can be -- and in a city rife with millionaires -- where teachers have to go on strike to get the basics for our students," Caputo-Pearl said. "Here we are in a fight for the soul of public education. The question is: do we starve our public neighborhood schools so that they (become) privatized, or do we re-invest in our public neighborhood schools for our students and for a thriving city?" The district's latest offer included adding nearly 1,200 teachers, counselors, nurses and librarians to schools, reducing class sizes by two students, and capping class sizes to between 32 and 39 students, depending on age and curriculum. The offer also included the district's previously proposed 6 percent salary increase over the first two years of a three-year contract. The district issued a statement via social media Sunday night, noting that district campuses on Monday "will be open providing every student with a safe and welcoming learning environment," although early education centers will only be open for special-needs students, and state preschool sites will be closed. "Los Angeles Unified did not want a strike and offered UTLA leaders a $565 million package to significantly reduce class sizes, add nearly 1,200 educators in schools and provide all UTLA members with 6 percent salary raises," the statement continued. "Los Angeles Unified remains committed to contract negotiations and will continue to work around the clock to find solutions to end the strike which will hurt students, families and communities most in need throughout Los Angeles." The union, United Teachers Los Angeles, wants a 6.5 percent hike that would take effect all at once and be retroactive to fiscal 2017. Union officials said some of the district's proposals would expire after a year, calling it disrespectful. Officials said the district was imploring the union to reconsider, adding that it rejected the new offer without proposing a counteroffer. "We remain committed to resolve the contract negotiations as soon as possible," superintendent Austin Beutner said at a Monday news conference. "We made our last proposal to UTLA on Friday, which was rejected... We urge them to resume bargaining with us anytime, anywhere, 24-7. We'd like to resolve this." A majority of UTLA's 35,000 members are expected to join the work stoppage. A large crowd of protesters with picket signs gathered in the rain Monday morning outside Los Angeles City Hall. They were planning to march to district headquarters. Abram van der Fluit, a Los Angeles teacher opposed to the strike, said in a statement Sunday that colleagues who agree with him are "fearful" of speaking out against the union. He's a former UTLA member and currently part of the California Teachers Empowerment Network, which describes itself as a nonpartisan information source for teachers and the public. "I don't support the rationale for the strike as articulated by UTLA," he said. "I don't believe that the reasons for the strike should be our priorities, as teachers." Van der Fluit, a 20-year LAUSD veteran who teaches high school biology, said the union should prioritize other issues including creating access to vocational education classes and providing options for students who want to pursue careers that don't necessarily require a college degree. Much of the acrimony between the district and the union centers around the new superintendent, Austin Beutner. The investment banker and former Los Angeles deputy mayor took the job last year without any experience in education. The union argues that Beutner is trying to privatize the district, encouraging school closures and flipping public schools into charter schools. Charters are privately operated public schools that compete with the school system for students and the funds they bring in. Beutner has said his plan to reorganize the district would improve services to students and families. The teachers are tapping into a shift in public sentiment that supports better wages for educators that came with a "Red4Ed" movement that began last year in West Virginia, where a strike resulted in a raise. The movement spread to Oklahoma, Kentucky, Colorado, Arizona and Washington state. As the second largest school district in the nation, LAUSD covers an area totaling 710 square miles and serves more than 694,000 students at 1,322 schools, although 216 schools are independent charter schools, most of which are staffed with non-union teachers that would not be affected by the strike. 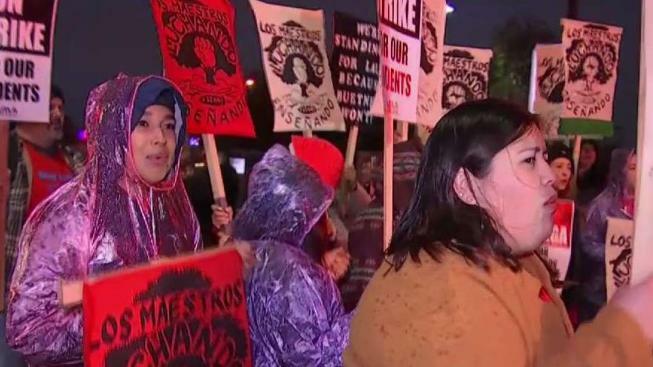 LAUSD says about 500,000 students and 1,100 schools will be impacted by the strike. The district also says it intends to attempt to keep some instruction going for students during the strike. Four hundred substitutes have been hired for the task, and 2,000 administrators with teaching credentials have been reassigned. However, with more than 25,000 teachers expected to strike and at least 31,000 UTLA members set to walk out, LAUSD is expected in many cases to do no more than supervise students during the day in auditoriums and other large spaces. LAUSD has established an information hotline for parents at (213) 443-1300 to answer questions about the planned strike and its possible impact. Picketing began Monday morning and coincided with the news conference at John Marshall High School. A rally and march started at Grand Park on Spring Street in front of City Hall and was expected to head downtown to LAUSD headquarters. There, more picketing by teachers, parents and students is set for between 2:30 to 3:30 p.m. in front of Marianna Avenue Elementary School, 4215 Gleason St. union officials said. The proceedings will wrap up with a 5 p.m. news conference at the UTLA building on 3303 Wilshire Blvd., organizers said. The UTLA said it will stream most events live on Facebook, Twitter and Instagram. On Sunday, United Way of Greater Los Angeles released a letter signed by a number of civic leaders that urged both sides to come together. "This crisis cannot be solved by the Los Angeles Unified School District alone. LAUSD is on the brink of fiscal insolvency -- a stark reality that has been acknowledged by Supervisor Mark Ridley-Thomas and other elected officials, UCLA Education Professor Pedro Noguera, President Obama's former Secretary of Education Arne Duncan, the Los Angeles County Office of Education, several forecasts commissioned by multiple LAUSD superintendents, and by the Los Angeles Times," the letter read. "...We urge the teachers union and the school district to reach an agreement and avert a strike, and to put their collective efforts toward securing resources for our teachers and students without devastating the finances of the district. This must include resolving the issue of the district's unsustainable pension liabilities." The city of Los Angeles has established a web site, at www.lamayor.org/StudentsAndFamilies, describing city resources available to students and parents during a strike. Mayor Eric Garcetti said the city would bolster staffing and resources at city recreation centers, libraries and Family Source Centers "to support families with additional options." Meanwhile, L.A. County Supervisors Mark Ridley-Thomas and Hilda Solis filed a motion on Friday seeking to identify up to $10 million in county funds that could be directed to the LAUSD to enhance health care for students. The motion will be presented to the Board of Supervisors on Tuesday. The county operates dozens of school-based health centers on LAUSD campuses, and the County Department of Mental Health also provides outpatient mental health services and crisis counseling throughout LAUSD. "A strike would disrupt the lives of so many students and their families. L.A. County is stepping up to help LAUSD because it is incumbent upon all of us to help find a way out of this impending crisis," Ridley-Thomas said.